The orthopedic surgeons at Agility Orthopedics are proud to announce that Agility is the only practice in New England to be accredited through the American Institute of Ultrasound in Medicine (AIUM) to perform ultrasounds for injection guidance and diagnostic purposes for patients with musculoskeletal disorders. 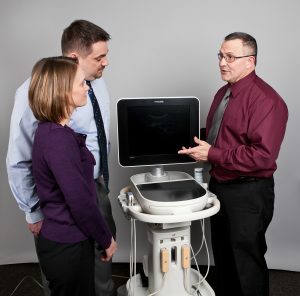 The use of ultrasound has been transformative to our practice of orthopedics. With regards to injection guidance, physicians can use ultrasound to direct injections to the exact location that they want the medicine to be delivered. With ultrasound, they can avoid the sensitive tissues and make injections more comfortable. Dr. Andersen states, “Because I can see the needle pass through the tissues, I am able to place the medication to the exact place that it is needed. This makes the injection more effective and less painful”. Ultrasound can also be used for diagnostic purposes. Physicians at Agility can place an ultrasound probe onto a patient and ascertain the integrity of specific tendons, muscles, and ligaments. Patients can often get the answers they need much quicker than with an MRI. Also, our patients with deductibles may appreciate the opportunity to avoid the expense associated with an MRI. At Agility, our physicians and staff are dedicated to providing you with an outstanding experience. Ultrasound imaging is one of the tools we can use to make you feel better sooner.